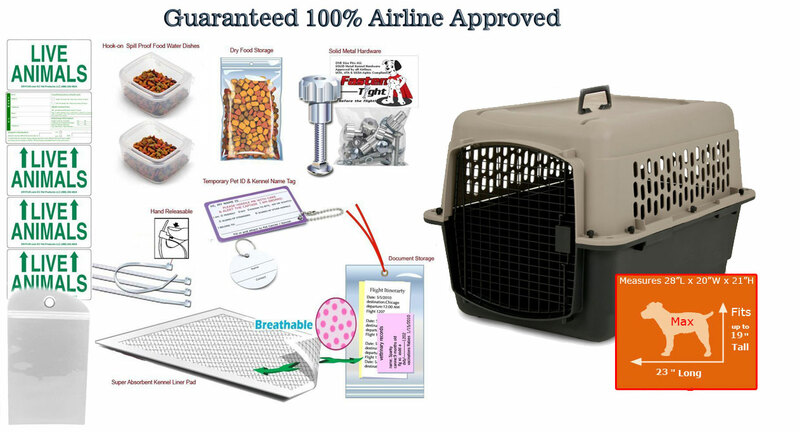 Our Airline Crates have all the latest state of the art safety features like pre-drilled Cable Tie Holes around the doors, Ventilation on all 4 sides, Solid Metal Nuts and Bolts,Covered Door Posts, Tie-down Strap holes on all 4 corners. I Live on an army base overseas and you delivered fast..Thanks! Kats N Us was a real pleasure to work with. All future orders will be placed through this company. I'm also very happy with the kennel! I will be ordering more carriers similar to the Max All-in-One for international travel. This crate is perfect and the customer service was excellent. Great experience shopping with Kats 'n Us! Purchased this for our schnoodle so that she can travel with us to Europe this summer. The crate arrived quickly and is very sturdy with ventilation on all 4 sides. Good business to buy from and great customer service. WHAT a relief to find this site and your exquisite product groupings for airline travel. Just brought an 8wk old boxweiler pup from Maryland to Alaska (2 flights, air cargo because of his large size), all without a hitch, and in complete safety and comfort. Your products -- each the very best available -- and the thoroughness with which you support them (printed checklists, how-to videos, instant customer service) gave a nervous new breeder the confidence to ship her furbaby to me. A dream come true. I thank you from the bottom of my heart. May your business experience every possible success!!! Working with this company was wonderful and the product as described. I did order the metal hardware due to local regulations. Very happy with this transaction on all levels. I am impressed with this company. They are fast, efficient, and personable. The products arrived on time and are just as presented. Well done. I will definitely use them again.